The maximal algebra of symmetries of the free single-particle Schrödinger equation is determined and its relevance for the holographic duality in non-relativistic Fermi systems is investigated. This algebra of symmetries is an infinite dimensional extension of the Schrödinger algebra, it is isomorphic to the Weyl algebra of quantum observables, and it may be interpreted as a non-relativistic higher-spin algebra. The associated infinite collection of Noether currents bilinear in the fermions are derived from their relativistic counterparts via a light-like dimensional reduction. The minimal coupling of these currents to background sources is rewritten in a compact way by making use of Weyl quantisation. 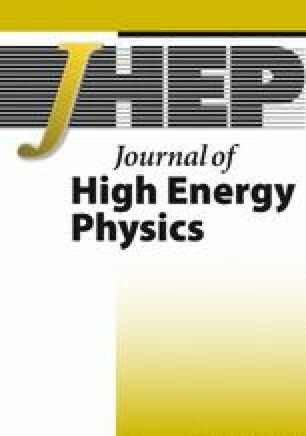 Pushing forward the similarities with the holographic correspondence between the minimal higher-spin gravity and the critical O(N ) model, a putative bulk dual of the unitary and the ideal Fermi gases is briefly discussed. Y. Castin and F. Werner, The unitary gas and its symmetry properties, arXiv:1103.2851. Y. Nishida and D.T. Son, Unitary Fermi gas, ǫ-expansion and nonrelativistic conformal field theories, arXiv:1004.3597 [INSPIRE]. J.-W. Chen and W.-Y. Wen, Shear viscosity of a non-relativistic conformal gas in two dimensions, arXiv:0808.0399 [INSPIRE]. X. Bekaert, E. Meunier and S. Moroz, Towards a gravity dual of the unitary Fermi gas, arXiv:1111.1082 [INSPIRE]. E. Sezgin and P. Sundell, Massless higher spins and holography, Nucl. Phys. B 644 (2002) 303 [Erratum ibid. B 660 (2003) 403] [hep-th/0205131] [INSPIRE]. X. Bekaert, S. Cnockaert, C. Iazeolla and M. Vasiliev, Nonlinear higher spin theories in various dimensions, in the proceedings of the First Solvay workshop on higher-spin gauge theories, May 12-14, Brussels, Belgium (2004), hep-th/0503128 [INSPIRE]. C. Iazeolla, On the algebraic structure of higher-spin field equations and new exact solutions, arXiv:0807.0406 [INSPIRE]. X. Bekaert, N. Boulanger and P. Sundell, How higher-spin gravity surpasses the spin two barrier: no-go theorems versus yes-go examples, accepted for publication in Rev. Mod. Phys., arXiv:1007.0435 [INSPIRE]. M. Valenzuela, Higher-spin symmetries of the free Schrödinger equation, arXiv:0912.0789 [INSPIRE]. D. Anninos, T. Hartman and A. Strominger, Higher spin realization of the dS/CFT correspondence, arXiv:1108.5735 [INSPIRE]. M. Vasiliev, Relativity, causality, locality, quantization and duality in the Sp(2M ) invariant generalized space-time, hep-th/0111119 [INSPIRE]. O. Gelfond and M. Vasiliev, Higher rank conformal fields in the Sp(2M ) symmetric generalized space-time, Theor. Math. Phys. 145 (2005) 1400 [Teor. Mat. Fiz. 145 (2005) 35] [hep-th/0304020] [INSPIRE]. S. Tan, Short range scaling laws of quantum gases with contact interactions, cond-mat/0412764. 3.Department of PhysicsUniversity of WashingtonSeattleU.S.A.